Ildiko Kalapac's sculpture is on display at the Spokane YWCA. The final First Friday event of 2016 includes a special event to unveil and dedicate a new sculpture commemorating and honoring women and children who are survivors of domestic violence. 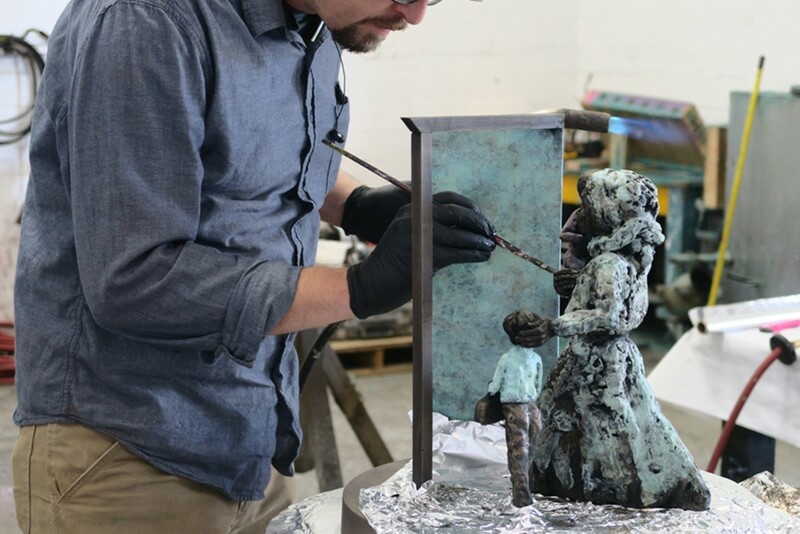 Commissioned by Spokane philanthropist and YWCA Spokane supporter Debra Garrett, the cast bronze statue by Spokane-based, Hungarian-born artist Ildikó Kalapács is titled Refuge. Depicting a woman and her two children walking through a doorway, surrounded by the inscription "enter here for peace," the piece was recently installed near the entrance of the YWCA's Alternatives to Domestic Violence Program. Other local artists are displaying their work at Friday's unveiling, from 5-7:30 pm at 930 N. Monroe; all art honors and acknowledges women. Kendall Yards Welcome Center, 1335 W. Summit Pkwy. Mom's Custom Tattoo, 1226 W. Summit Pkwy. William Grant Gallery, 1188 W. Summit Pkwy.